It’s been a while since I visited Farmer’s Apprentice. It seems their younger sister bar Grapes and Soda next door has gained more attention recently, winning the Best Bar and Bartender of the Year. So I decided to make a foodie date interesting with a dinner-cocktail combination covering both the restaurant and the bar. The restaurant is known for one of the pioneers of bringing the farm-and-table concepts to flourish. Very curious how they have evolved. Despite knowing we were going to have cocktails next door, we ordered a couple of cocktails to set the mood. The Martini ($11) here impressed me with the shaken mix of gin, Noilly Prat dry and orange bitters with cleanliness. 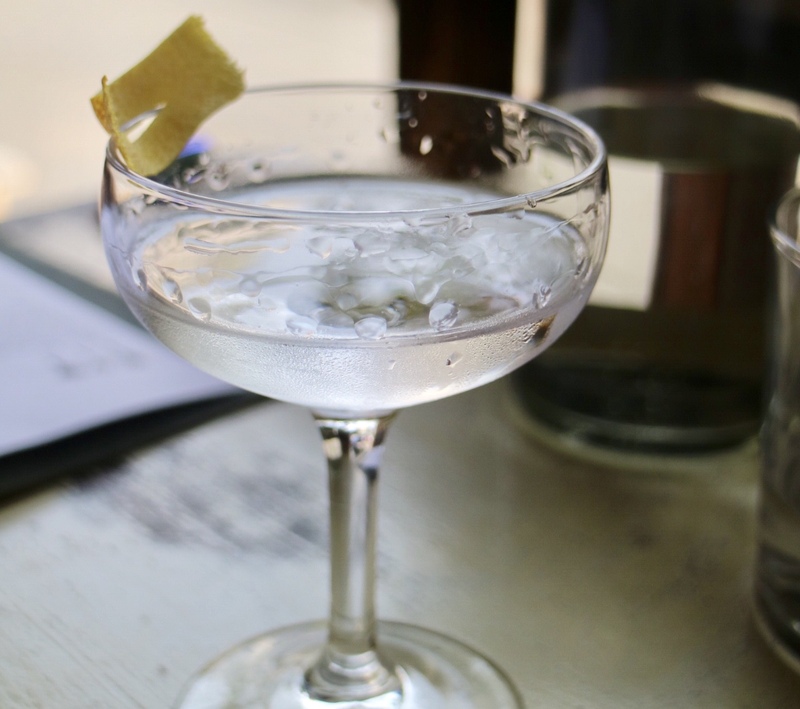 Don’t get me wrong, a clean tasting martini is nowhere near being bland. The state of cleanliness is achieved through the perfect balance of subtle flavours and aromas, and the perfect temperature to fine-tune that balance. 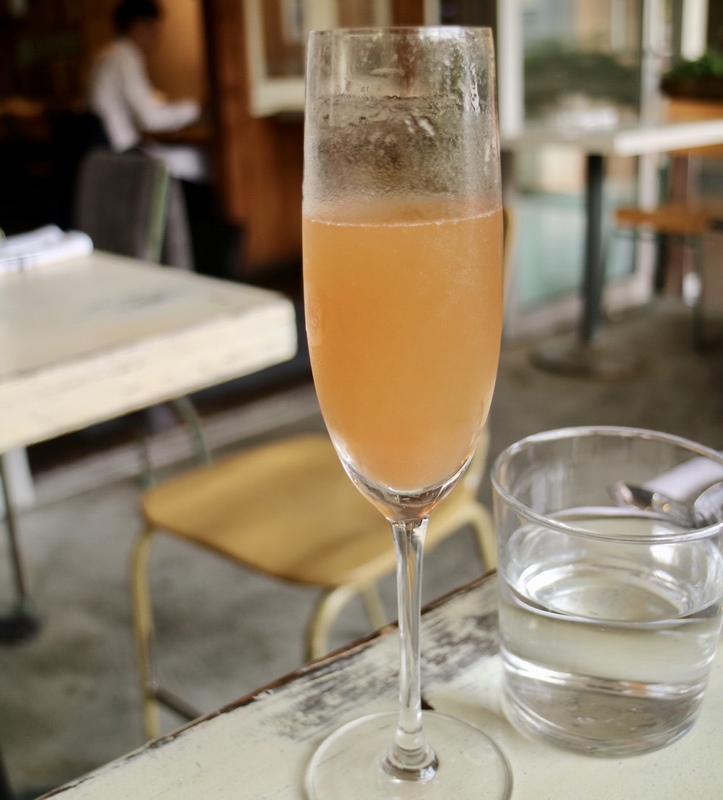 My companion took the Seasonal Sparkling Cocktail ($13), a showcase of the flavour of newly harvested pear mixed with sparkling. The restaurant changed the dining format not too long ago. The dinner menus now are subject to change nightly according to their supply of seasonal ingredients from local farms. 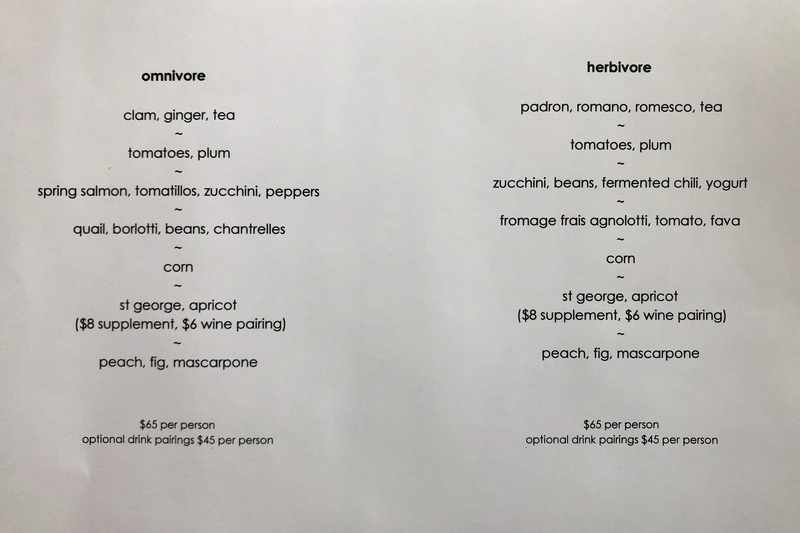 There are the meat-focused “omnivore” and the entirely vegetarian “herbivore”, both offered in 4-course tasting for $50 and 6-course tasting for $65. A wine pairing option is also available at $45. We decided to try both 6-course menus. I also ordered a glass of orange wine to go with my dinner, the Daniel Ramos ‘Kπ’ Sauvignon Blanc 2015 ($14) from Cebreros, Spain. 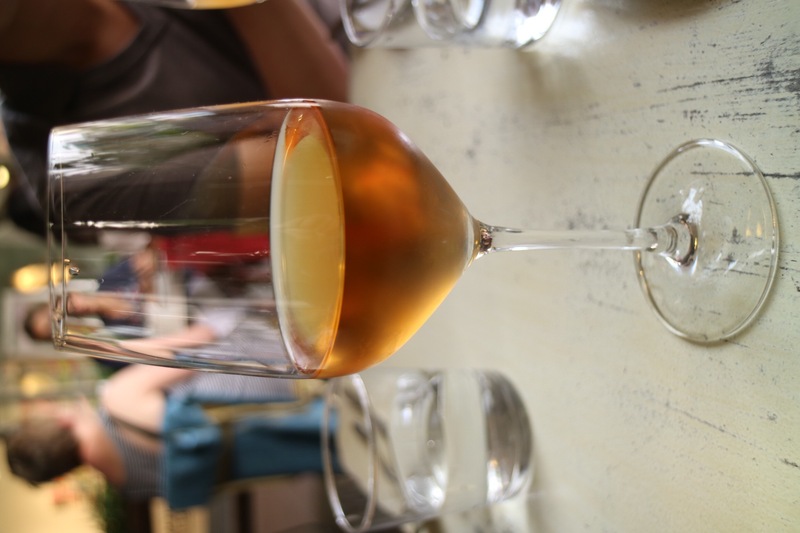 The orange wine is apparently popular in Europe and starting to get attention in North America. Farmer’s Apprentice is one of the few restaurants that carry it. 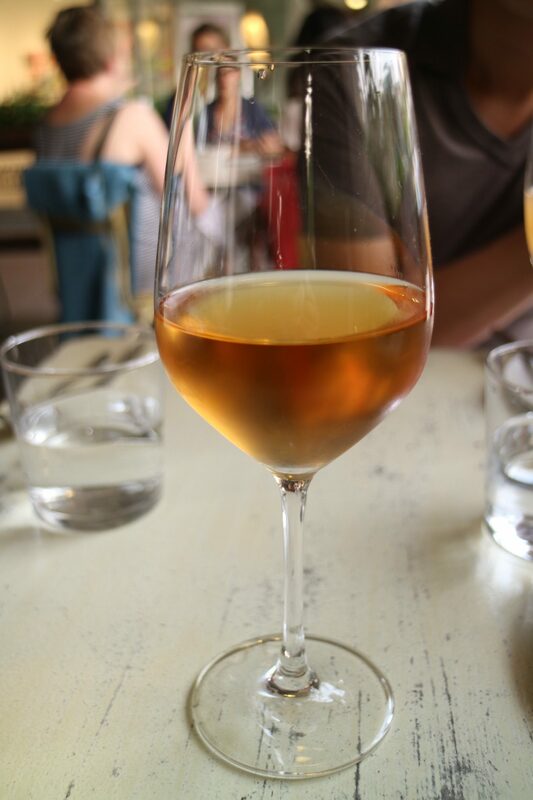 Orange Wine, also known as Natural Wine, is made with white wine grapes through a natural process of fermentation with little to no additives, often not even yeast. To me, the taste was between a fruit beer and a sherry, very dry and acidic, exhibiting notes of exotic fruits and a hint of fermentation taste of sherry. This is all very different. Can’t say I’m a huge fan yet, but this definitely came across as interesting. Would definitely try more in the near future. 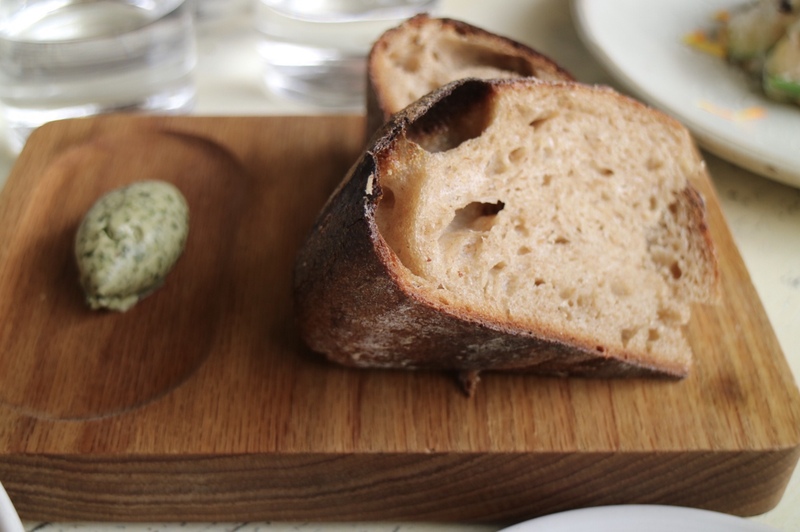 The complimentary house-made bread came with a herb butter that’s delicious. 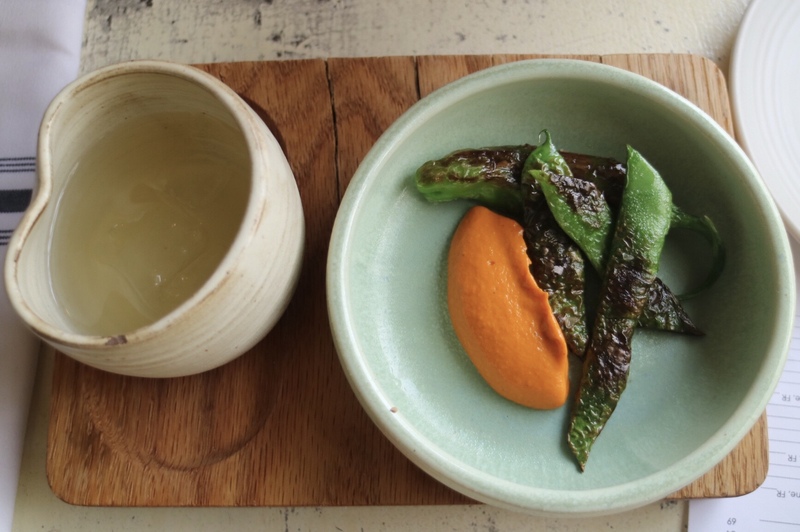 For the first course, it was the Clam, Ginger and Tea vs. the Padron, Romano, Romesco, and Tea, both served with city cold genmai tea. 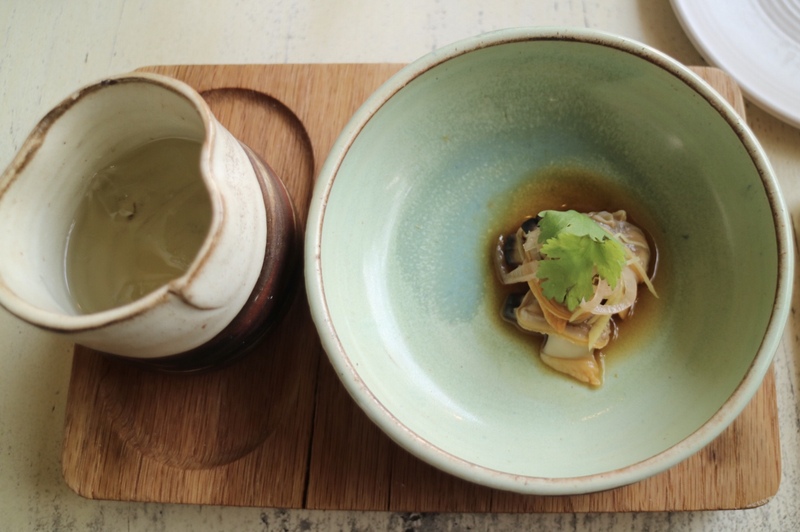 The clams were prepared beautifully in the ginger broth, with boldly sweet seafood flavour presented in a subtle way, while the blistered Padron pepper was paired with the flavourful tomato-forward Romesco. The tea component works in both dishes but in different ways. We were off to a good start. The second course is the same for both menus. 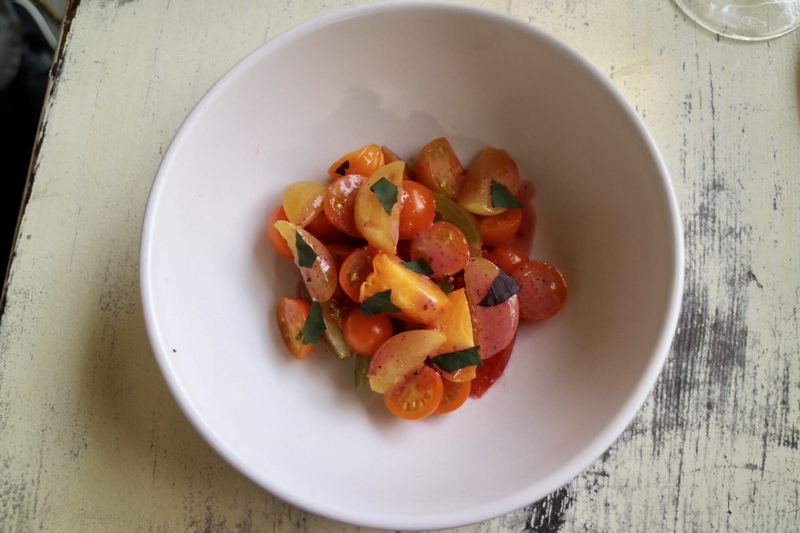 The Tomatoes and Plum were lightly dressed to showcase the natural flavours, with a touch of fresh basil. It was a perfect amount of those little gems. Course #3 turned out to be the Salmon, Tomatillos, Zucchini, and Peppers for the “omnivore” set and the Zucchini, Beans, Fermented Chili, and Yogurt for the “herbivore” The piece salmon as perfect cooked, but I found the vegetable combination too similar to the last tomato and plum dish. Maybe they could have done a more complex sauce to get away with it. 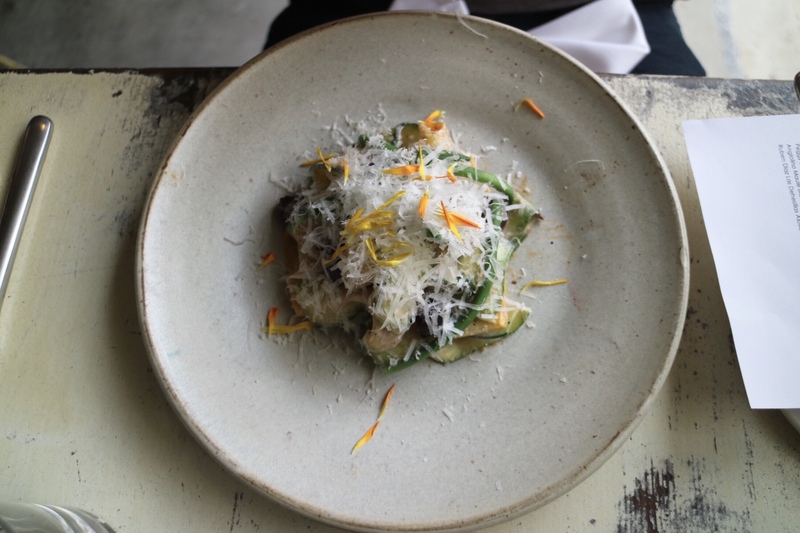 The veggie course on the other side was just okay, with thinly shaved cheese on top of the zucchini noodles, visually it was a little messy, and it did not feel very substantial compared to the meat dish. 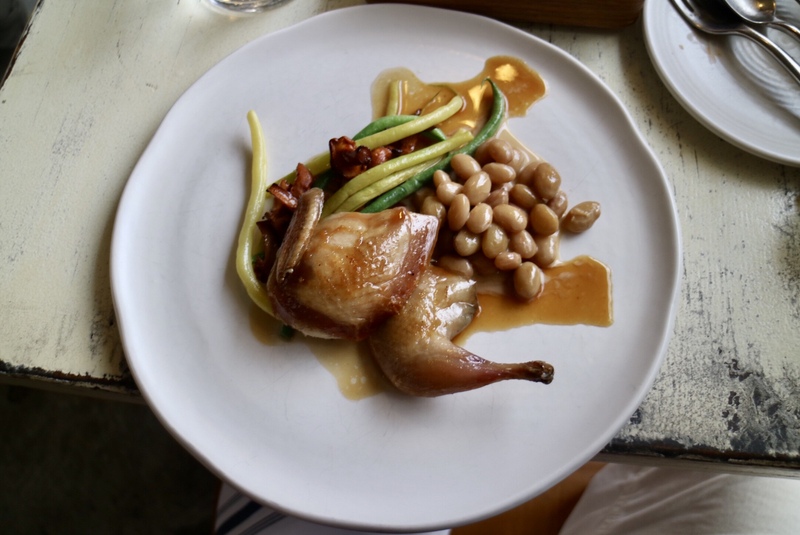 The next dishes were a bit more substantial when we found the Quail, Borlotti, Beans, and Chanterelles for the meat lovers and the Fromage Frais Agnolotti, Tomato, and Fava. The succulent quail received a divine treatment and was rather appealing. 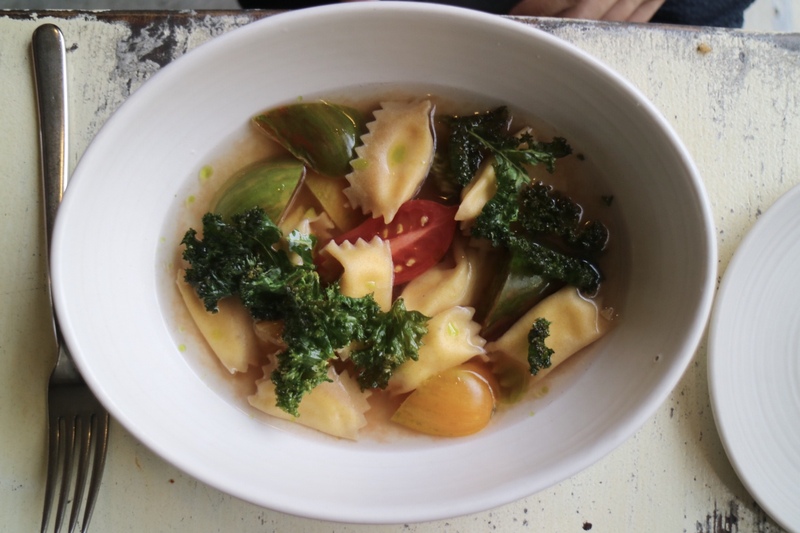 The Agnolotti was tasty as well. However, we found tomatoes and beans in a clear broth again. Deja vu? 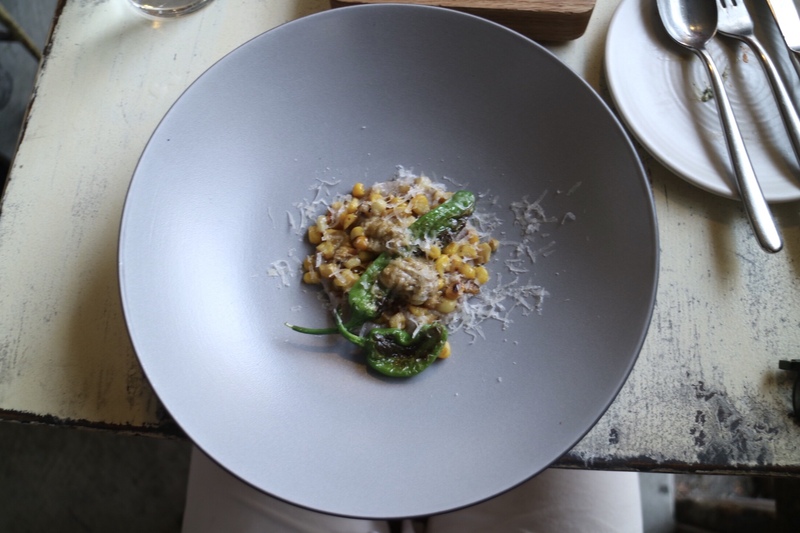 Both menus have the same 5th course, the Corn. This one is somewhat inspired by American South cooking with sauteed sweet corn kernels mixed with charred peppers topped with shaved cheese. The corn kernels were tasty and the sweetness worked well with the kick from the peppers. However, this is the 2nd time the vegetarian diner received charred pepper with it in the 2nd course. 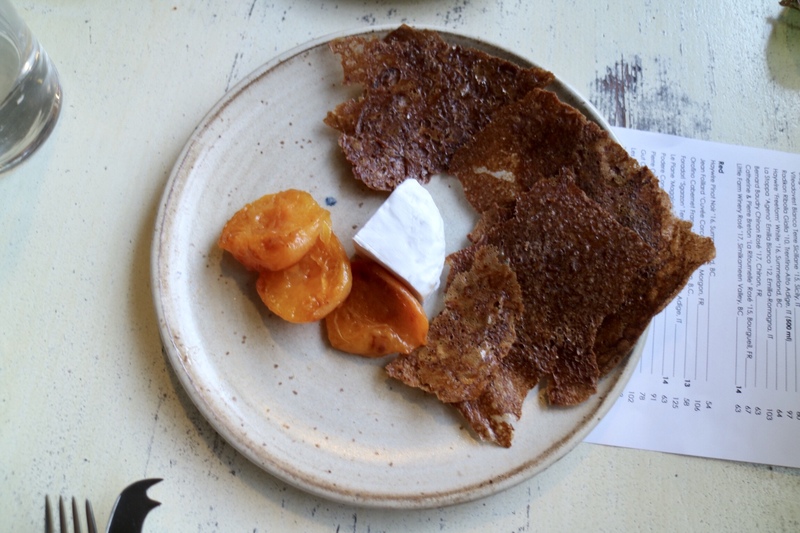 For $8, there is an option of an additional cheese course serving St George cheese, dried apricot and some house-made crackers. We only ordered one, and we were not too crazy about this course. The cheese was too rich and we couldn’t even finish it. At this point, we were both very full. 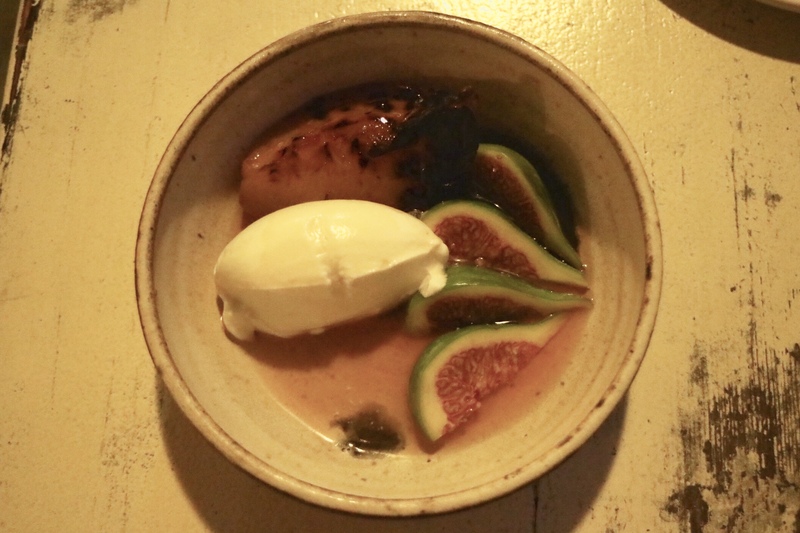 Despite the very attractive dessert course, the Peach, Fig, and Mascarpone were a little too rich to be finished. I tried my best to eat up the fruits but the Mascarpone is just too much after we had that cheese course. I like the fact that the restaurant switched to the tasting menu format. And the price was quite reasonable for the amount of the food and the quality of the ingredients. 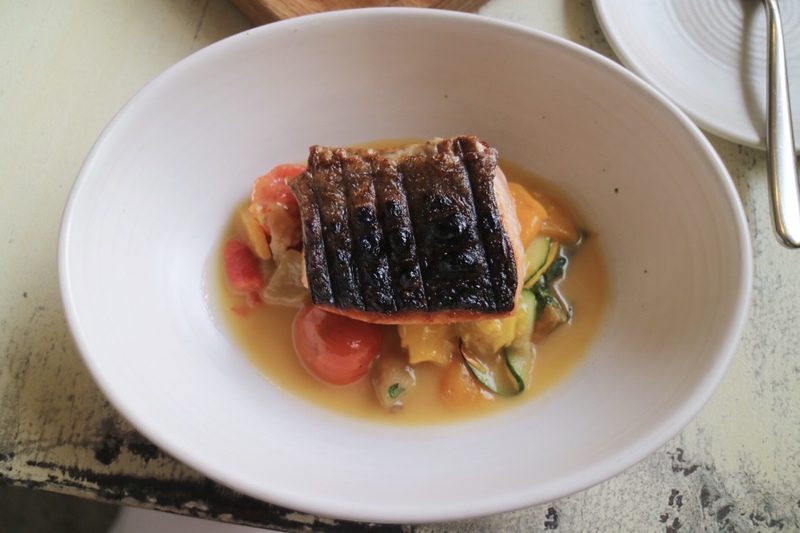 There were points of brilliance on both menus, such as the tomato and plum salad, the salmon, the quail and the agnolotti. But overall the meat-focused menu is much better than the vegetarian one. It seemed like they had to use the same ingredients in different courses. Portion wise, it could be smaller for each course by using fewer ingredients, which could help to avoid repeating the same ingredient in different dishes. If you go with another person for dinner, it’s better for both to take the same menu. We thought we would taste more things if we took one meat and one veggie, but ended up having a lot of redundant components. But overall, we enjoyed the flavours from the quality local produce.